These are interesting times for airports, a vital part of business travel. New Doha International opens in a few weeks’ time, late but impressive. Brandenburg Berlin struggles on with an in-service date we know not, and Dubai just expands and expands. The figures speak for themselves. 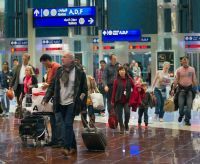 In 2002, 10 years ago, Dubai International Airport was visited by just under 16m passengers. For 2012 the figure is 57.6m, a 13% rise over 2011. Assuming the numbers continue to increase at the same rate, by 2020 it will become the third busiest airport in the world, and with no domestic traffic easily outstripping Heathrow in terms of international travellers. About 80% of passengers are transferring to a connecting flight. The airport has two parallel runways 4,300m long. All this for a tiny country whose limited oil and gas reserves will disappear over the next 20 years. Of its population, thought to around 2m, only 16% are of Arab ethnicity (300,000 plus). 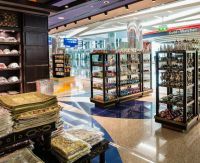 There are essentially four terminals at Dubai plus a partially complete (cargo operations only) entirely new separate facility Dubai World Central International Airport, planned as a four-runway extravaganza capable of handing up to 150m passengers annually, but now on hold. Terminal 1 is the main international airline building at Dubai, with the exception of Emirates and now Qantas. Terminal 2 serves the Indian sub-Continent and is the base for the Flydubai budget operation. There is a fourth terminal for Royal and VIP flights. 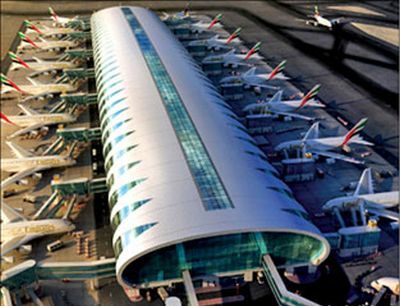 Terminal 3 opened on 14 October 2008, and was built exclusively for the use of Emirates. In just four years it has outgrown itself with Concourse A now open (see BTN 11 February), designed specifically for the Airbus A380. First Class and Business Class Emirates passengers arriving at Terminal 3 need to be driven to an exclusive drop-off area and then it is quickly into a special check-in and security facility. A short walk takes you into the B Gates area (essentially non-long haul) and then a 1km underground ride is required to Concourse A.
Concourse A is immense, 645m long, 90.8m wide and 42m high. Annual capacity is put at 19m passengers and there are 14 cafés and restaurants including three bars. First Class and Business Class have their own dedicated floors taking up most of the available area. First Class passengers also have a private Duty Free shop where prices are not displayed. Also close by is a Le Clos wine cellar. Passengers to the US should not buy. Liquids over 100ml in capacity will be confiscated by American airport security. The Concourse A building itself covers much the same area as the main Stansted terminal (capacity 35m passengers) but without the train ride and walks to the actual gates. However it is over twice as long and under half the width. At the top of the structure is a 5-star hotel with 32 rooms including seven suites, and a 170-room 4-star property offering 30 suites. It complements the existing Dubai International Airport Hotel in Terminal 1 and 3 which has five Royal/Presidential Suites, nine Executive Suites, 38 Executive Rooms, 14 Junior Suites, 22 Superior Deluxe Rooms, 253 Deluxe Rooms and even a swimming pool. The hotels are airside. The Concourse A executive lounges offer customers fine dining with showcase kitchens, conference rooms, business centres, a Timeless Spa, entertainment zones, dedicated smoking areas as well as children’s play facilities. It is a quiet and restful area, whether changing planes or waiting for a flight. Access to the aircraft is by elevator to the airbridge, Economy Class passengers are kept completely separate from those on the upper deck. Concourse A also offers an enhanced Duty Free shopping and dining experience featuring a wide variety of high-quality and globally recognised food and beverage brands which include Paul, Umaizushi Bistro, Picnic, Wafi Gourmet, Carluccio’s, Cho Gao, Pulp Juice Bar, McDonalds and McCafe, Shake Shack, Costa Metropolitan, Starbucks, Le Pain Quotidien, Giraffe, Heineken Lounge, Jack’s Bar & Grill and Moet & Chandon Champagne Bar. Whilst there is Fast Track and special facility immigration controls this is one area that the airport is working on. The border check area is painfully slow.